Vertical sleeve gastrectomy (VSG) is surgery to decrease the structure and size of your stomach. This restricts the amount of food you are able to consume. 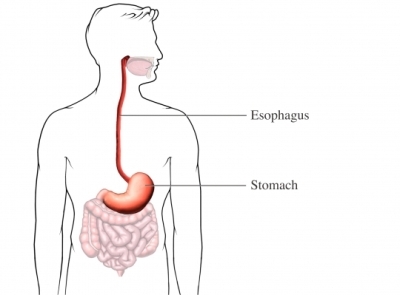 This surgery involves re-shaping the stomach to reduce the amount of food it can hold. Long-term complications include vomiting and developing gallstones . Do not start any new medications, herbs, or supplements without talking to your doctor. You may be given antibiotics. You may be given laxatives and/or an enema to clear your intestines. The night before, eat a light meal. Do not eat or drink anything after midnight unless told otherwise by your doctor. General anesthesia will be given through an IV. It will block pain and keep you asleep through surgery. Several small cuts will be made in your abdomen. Gas will be pumped in to inflate your abdomen, making it easier for the doctor to see. A laparoscope and surgical tools will be inserted through the incisions. A laparoscope is a thin, lighted tool with a tiny camera. It sends images of your abdominal cavity to a monitor. Your doctor will operate while viewing the monitor. Surgical staples will be used to divide the stomach vertically. The new stomach will be the shape of a slim banana. The rest of the stomach will be removed. Your new stomach can hold 50-150 mL (milliliters) of food—about 10% of what a normal adult stomach can hold. Incisions will be closed with staples or stitches. In some cases, the doctor may need to switch to open surgery. The breathing tube and catheter will be removed. The usual length of stay is 2-3 days. A small tube with a camera may be used to look down your throat and into your stomach to check for problems. You will receive nutrition through an IV, but then slowly start eating again. Do not lift anything heavy for at least 2 weeks. You will meet regularly with your healthcare team for monitoring and support. Eat a clear liquid diet for about 1 week. Begin with 4-6 small meals per day. A meal is 2 ounces of food. Your diet will progress from soft, pureed foods to regular foods. Solid food must be well-chewed. Do not eat too much or too quickly. Avoid dehydration by drinking fluids before or after meals. Gastric sleeve surgery. Cleveland Clinic website. Available at: https://my.clevelandclinic.org/departments/bariatric/treatments/gastric-sleeve. Accessed December 22, 2017. Sleeve gastrectomy. Virginia Mason Medical Center website. Bariatric Surgery Center of Excellence website. Available at: https://www.virginiamason.org/sleeve-gastrectomy. Accessed December 22, 2017. Weight management procedures. North Shore Medical Center website. Available at: https://nsmc.partners.org/weight%5Fmanagement/procedures. Accessed December 22, 2017. 3/23/2015 DynaMed Plus Systematic Literature Surveillance http://www.dynamed.com/topics/dmp~AN~T905418/Prevention-and-management-of-postoperative-ileus : Short V, Herbert G, Perry R, et al. Chewing gum for postoperative recovery of gastrointestinal function. Cochrane Database Syst Rev. 2015;(2):CD006506.